Jim Corbett National Park is an India National Park which is founded for the protection of the endangered Bengal Tiger of India in the year of 1936. India is a home of large variety of plants, animals and fauna. For the preservation of wild life in India one can find numerous wild life sanctuaries and national park. In these parks and sanctuaries the Jim Corbett National Park is the oldest national park of India. It is situated in Nanital, Uttarakhand state of India. It is named after the history greatest hunter and wild life explorer Jim Corbett. * Jim Corbett National Park was founded in the year of 1936. * It was named after the all time great hunter and wild life explorer Jim Corbett. * Jim Corbett National Park located in Nanital District of Uttarakhand state of India. * This world famous place is surrounded the great Himalayan Mountain. * The area of the Jim Corbett National Park is around 520 square KM. * Jim Corbett National Park official website is corbettnationalpark.in. * In the year of 2010, around 70,000 visitors were visited in Jim Corbett National Park. * Elephant Safari is one of the major attractions of Jim Corbett National Park. 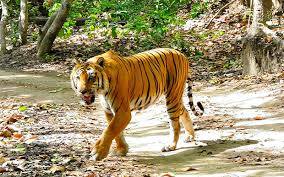 * Jim Corbett National Park is take care by Uttarakhand Govt., Project Tiger and Corbett National Park. * It is the oldest national park in India. * Jim Corbett National Park is founded for the protection of the endangered Bengal Tiger of India. This project is well known as Project Tiger. * It restrains 488 different species of plants, 50 species of mammals, 580 bird species and 25 reptile species. * In Jim Corbett National Park rain season is from Jul to Sep.
* The best time to visit Jim Corbett National Park is from Oct-Dec and Feb-Jun Month. * In here hunting is prohibited. * Dhikala is one of the popular tourist place located in Jim Corbett National Park. From this beautiful place one can enjoy the spectacular natural beauty of the valley.